When choosing a paint colour, the effect of light on your chosen colour is one of the most essential factors to consider. Colours change under different lighting conditions, so here we share our tips on how to create harmony with colour and light. We often fall into the trap of planning our schemes only in natural light conditions and don't consider how the scheme will work in artificial light. So think about when you mainly use the space you are planning to decorate and think about the main source of light during those times. "True" natural light is balanced between warm and cool tones, but it can vary depending on the time of the day, where you live and which way the room faces. If your room faces north, light is indirect and tends to be cool. Light can even appear grey on an overcast day. If your room faces south, the light will be warmer and can become intense at mid day. East facing rooms enjoy bright, yellow light whilst west-facing rooms enjoy the muted, late afternoon light. There are some colour recommendations for each below. Old style incandescent bulbs emit warm tone light, similar to natural daylight. As light bulb technology has evolved, each type of light source, be it LED, fluorescent, halogen.... emits a different, and less tonally balanced, colour of light. Using a variety of types of lightbulbs in a space is a great way to create a more tonally balanced lighting scheme that will in turn ensure your colour is more true. Sheen means how shiny or flat your paint finish is. In the UK we are quite traditionally about which sheens go on which surfaces - flat for walls, satin for woodwork..... but there is no reason to stick to this and paints like Benjamin Moore Aura and Regal Select offer multiple sheen levels that can work on many types of surface. More reflective sheen levels, such as our eggshell sheen, work well in rooms with diffuse, indirect light whereas flatter sheens work well in rooms with direct light. Be sure to test out the colour before you commit. Once you've narrowed it down to the final one or two colours, paint out large squares on all of the different walls of your room and be sure you evaluate how the colour looks in the dark and light spots. We recommend painting an area of at least 50cm2 in order to eliminate the influence of your current wall colour on your perception of your new one. 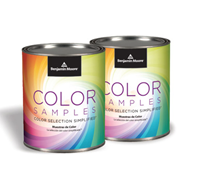 Our Colour Samples give you 470ml of paint for just that reason, so you can paint a good sized area on multiple walls. Then live with your colour for a few days and make sure you are happy with it when you use the room as you normally would. When lighting levels are low, we all instinctively reach for the lightest colour we can find. But light in north-facing rooms is cool and blue-toned, making colours with grey, blue or lavender undertones appear more dull (which includes most "brilliant whites"). To counter-balance this, choose colours that are more saturated with a warm yellow or red undertone. Sunny Soleil AF-330 or warm Secluded Beach 899 work well. 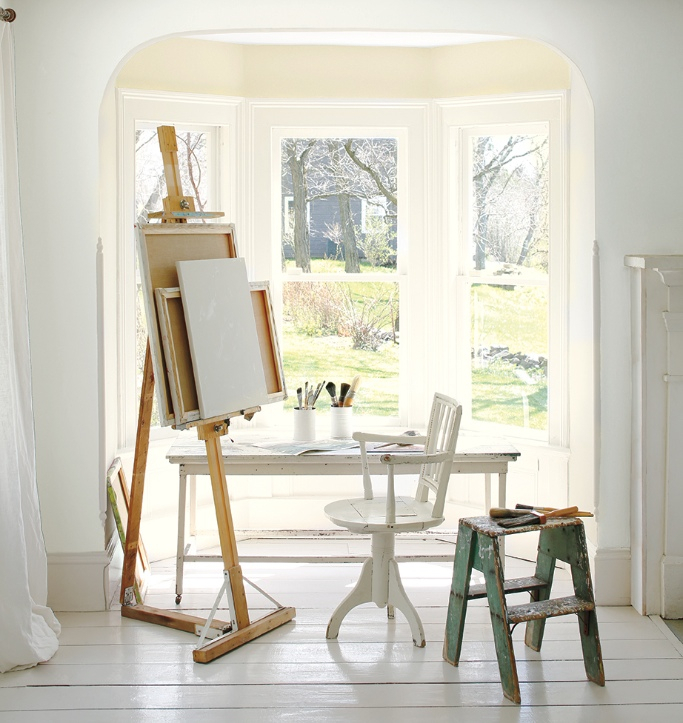 If it has to be white, go with Cotton Balls OC-122 which is a clean, bright white with warm, yellow undertones. Strong colours can make a room feel up-beat and modern, so for a dramatic, bold statement, go with Ravishing Red 2008-10. South-facing rooms rarely pose the same kind of challenges, the direct light is warm and, at times, intense. So really any colour goes in this environment. However, sometimes south-facing rooms can benefit from cooler, greyer tones to create a more diffuse and calming feel. A popular mid-tone such as Thunder AF-685 will look fresh throughout the day and rich in the evening. Wythe Blue HC-143 is another real favourite, the perfect muted blue/green. Pair either of these with Decorators White PM-3 to complete your scheme. East-facing rooms are flooded with bright, warm light in the morning but this fades to cool, blue light by late afternoon. So, consider when you use the room the most and pick colours carefully to ensure they don't look dull towards the end of the day. Warm pinks and yellows such as Pink Bliss 2093-70 or Ylang Ylang AF-305 would be perfect for enhancing the light, while blues and greens like Bird's Egg 2051-60 will temper it. These rooms benefit from muted, late afternoon sunlight, meaning greens and creams work particularly well. Try pairing Hancock Green HC-117 with Easter Lily 2150-70. If you are looking for the ideal grey for a west facing room, check out Classic Gray OC-23 or Balboa Mist 1549 which are warm enough to counter the blue tone of evening light.